One of the most ageing things that can happen to your legs is for them to start showing ugly varicose veins. 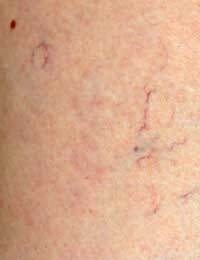 These are enlarged and often swollen veins which appear most commonly on the backs of your calves or on the inside of your leg, usually dark blue or purple in colour. Getting rid of varicose veins once they appear is difficult so the best way to fight them is through prevention. So how do you prevent these ageing varicose veins? Before you can know how to prevent varicose veins, it helps to have an understanding of just what veins are and how they work. While arteries are the blood vessels which carry blood from your heart – full of oxygen and nutrients – to your cells, veins are the opposite: they are the blood vessels which carry the depleted blood, which is also full of carbon dioxide and other waste products, back away from your cells, through the liver to be cleansed and then back to the heart and lungs to be replenished with oxygen. Therefore, veins do not have the strong pressure exerted on them by the force of the pumping of your heart. Instead, they rely on one-way valves, as well as the squeezing action of moving muscles, to propel blood back to your heart. Why do varicose veins develop? There are several factors which contribute to the development of varicose veins. Firstly – while your body is a remarkably efficient machine – the system does start to fail eventually, due to general prolonged wear & tear and the constant pressure from gravity – in other words, the process of ageing. In addition the one-way valves also start to fail, causing blood to “leak” back through and collect in the veins, sometimes even becoming clogged and congested. These congested areas can then cause the vein to enlarge abnormally and become “varicose veins”. Other factors that can lead to the development of varicose veins include being obese, standing or sitting with your leg in certain positions for prolonged periods, injuring your leg and hereditary factors, such as being born with weaker valves in your legs. It is estimated that over 40% of women will suffer from abnormal veins in their legs by the time they reach their 50’s. Does it matter if I have varicose veins? Varicose veins can be very unsightly – they are often dark in colour and can look like thick cords bulging and twisting around your legs – and this can seriously affect some people’s self-confidence. But aside from aesthetics, varicose veins can also be a health risk and they will only worsen over time. They can become painful when you stand or walk or cause cramps at night; the skin around them can become very itchy, leading to ulcers forming, and they can even – in rare cases - produce fatal blood blots that can travel to your heart and lungs. So how can I prevent varicose veins? While it is not possible to guarantee the prevention of varicose veins, there are several things you can do to help reduce the chances of them developing. Weight plays a huge role and obesity is one of the risk factors for developing varicose veins. Your veins are already having to cope with the pressures of normal gravity so the less strain you put on them with additional weight, the better. Cardiovascular strength and health is very important to maintaining a strong even blood flow that prevents blood pooling and collecting. So any exercises that promote circulation and muscle tone will help, as well as those that improve your leg strength. Watch your body position, particularly how you sit: avoid crossing your legs and make sure you take a break and move around at least every 30 minutes. Try to avoid standing still for prolonged periods. If you must remain on your feet, keep shifting your weight from leg to leg every few minutes. Try to elevate your legs whenever you can when you are resting. Try not to wear clothing that is too tight or constricting, especially around your waist, legs and groin. However, the use of specially prescribed graduated compression or elastic support stockings can help, especially if you have already started developing varicose veins. Eat a heart-healthy diet, to keep your heart strong and your blood vessels clear. Include lots of high-fibre foods in your diet, such as fresh fruit and vegetables and whole grains. Also, make sure you eat foods high in Vitamin C and flavenoids, both of which help in building and protecting strong blood vessels. Don’t forget your liver, since large portion of your venous blood will have to pass through your liver before returning to your heart. Therefore, anything which causes blockages in the liver (such as due to inflammation and tissue degeneration from over-exposure to alcohol an certain medication) will cause blood pooling further down the veins and thus lead to varicose veins. By adhering to just even just some of these simple routines and precautions, you can go a long way towards helping to prevent the development of ugly, ageing varicose veins.